Significant anniversaries are solemnly commemorated – Japan's attack on the US naval base at Pearl Harbor, for example. Others are ignored, and we can often learn valuable lessons from them about what is likely to lie ahead. Right now, in fact. At the moment, we are failing to commemorate the 50th anniversary of President John F Kennedy's decision to launch the most destructive and murderous act of aggression of the post-second world war period: the invasion of South Vietnam, later all of Indochina, leaving millions dead and four countries devastated, with casualties still mounting from the long-term effects of drenching South Vietnam with some of the most lethal carcinogens known, undertaken to destroy ground cover and food crops. The prime target was South Vietnam. The aggression later spread to the North, then to the remote peasant society of northern Laos, and finally to rural Cambodia, which was bombed at the stunning level of all allied air operations in the Pacific region during second world war, including the two atom bombs dropped on Hiroshima and Nagasaki. In this, Henry Kissinger's orders were being carried out – "anything that flies on anything that moves" – a call for genocide that is rare in the historical record. Little of this is remembered. Most was scarcely known beyond narrow circles of activists. 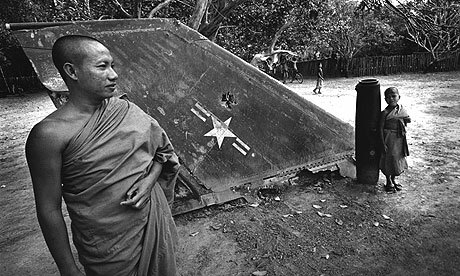 When the invasion was launched 50 years ago, concern was so slight that there were few efforts at justification, hardly more than the president's impassioned plea that "we are opposed around the world by a monolithic and ruthless conspiracy that relies primarily on covert means for expanding its sphere of influence", and if the conspiracy achieves its ends in Laos and Vietnam, "the gates will be opened wide." Elsewhere, he warned further that "the complacent, the self-indulgent, the soft societies are about to be swept away with the debris of history [and] only the strong … can possibly survive," in this case reflecting on the failure of US aggression and terror to crush Cuban independence. By the time protest began to mount half a dozen years later, the respected Vietnam specialist and military historian Bernard Fall, no dove, forecast that "Vietnam as a cultural and historic entity … is threatened with extinction … [as] … the countryside literally dies under the blows of the largest military machine ever unleashed on an area of this size." He was again referring to South Vietnam. When the war ended eight horrendous years later, mainstream opinion was divided between those who described the war as a "noble cause" that could have been won with more dedication, and at the opposite extreme, the critics, to whom it was "a mistake" that proved too costly. By 1977, President Carter aroused little notice when he explained that we owe Vietnam "no debt" because "the destruction was mutual." There are important lessons in all this for today, even apart from another reminder that only the weak and defeated are called to account for their crimes. One lesson is that to understand what is happening, we should attend not only to critical events of the real world, often dismissed from history, but also to what leaders and elite opinion believe, however tinged with fantasy. Another lesson is that alongside the flights of fancy concocted to terrify and mobilize the public (and perhaps believed by some who are trapped in their own rhetoric), there is also geo-strategic planning based on principles that are rational and stable over long periods because they are rooted in stable institutions and their concerns. That is true in the case of Vietnam, as well. I will return to that, only stressing here that the persistent factors in state action are generally well concealed. Later, as the scale of the US defeat in Iraq was becoming difficult to suppress, the government quietly conceded what had been clear all along. In 2007-2008, the administration officially announced that a final settlement must grant the US military bases and the right of combat operations, and must privilege US investors in the rich energy system – demands later reluctantly abandoned in the face of Iraqi resistance. And all well kept from the general population. The title article calls for "retrenchment" in the "humanitarian missions" abroad that are consuming the country's wealth, so as to arrest the American decline that is a major theme of international affairs discourse, usually accompanied by the corollary that power is shifting to the East, to China and (maybe) India. The lead articles are on Israel-Palestine. The first, by two high Israeli officials, is entitled "The Problem is Palestinian Rejection": the conflict cannot be resolved because Palestinians refuse to recognize Israel as a Jewish state – thereby conforming to standard diplomatic practice: states are recognized, but not privileged sectors within them. The demand is hardly more than a new device to deter the threat of political settlement that would undermine Israel's expansionist goals. The opposing position, defended by an American professor, is entitled "The Problem Is the Occupation." The subtitle reads "How the Occupation is Destroying the Nation." Which nation? Israel, of course. The paired articles appear under the heading "Israel under Siege". "[S]keptics of military action fail to appreciate the true danger that a nuclear-armed Iran would pose to US interests in the Middle East and beyond. And their grim forecasts assume that the cure would be worse than the disease – that is, that the consequences of a US assault on Iran would be as bad as or worse than those of Iran achieving its nuclear ambitions. But that is a faulty assumption. The truth is that a military strike intended to destroy Iran's nuclear program, if managed carefully, could spare the region and the world a very real threat and dramatically improve the long-term national security of the United States." Others argue that the costs would be too high, and at the extremes, some even point out that an attack would violate international law – as does the stand of the moderates, who regularly deliver threats of violence, in violation of the UN Charter. American decline is real, though the apocalyptic vision reflects the familiar ruling-class perception that anything short of total control amounts to total disaster. Despite the piteous laments, the US remains the world dominant power by a large margin, and no competitor is in sight, not only in the military dimension, in which, of course, the US reigns supreme. China and India have recorded rapid (though highly inegalitarian) growth, but remain very poor countries, with enormous internal problems not faced by the West. China is the world's major manufacturing center, but largely as an assembly plant for the advanced industrial powers on its periphery and for western multinationals. That is likely to change over time. Manufacturing regularly provides the basis for innovation, often breakthroughs, as is now sometimes happening in China. One example that has impressed western specialists is China's takeover of the growing global solar panel market, not on the basis of cheap labor, but by coordinated planning and, increasingly, innovation. Furthermore, China's recent economic growth has relied substantially on a "demographic bonus", a very large working-age population. "But the window for harvesting this bonus may close soon," with a "profound impact on development": "Excess cheap labor supply, which is one of the major factors driving China's economic miracle, will no longer be available." Not all prominent voices foresee American decline. Among international media, there is none more serious and responsible than the London Financial Times. It recently devoted a full page to the optimistic expectation that new technology for extracting North American fossil fuels might allow the US to become energy-independent, hence to retain its global hegemony for a century. There is no mention of the kind of world the US would rule in this happy event, but not for lack of evidence. At about the same time, the International Energy Agency reported that, with rapidly increasing carbon emissions from fossil fuel use, the limit of safety will be reached by 2017, if the world continues on its present course. "The door is closing," the IEA chief economist said, and very soon it "will be closed forever". Shortly before the US Department of Energy reported the most recent carbon dioxide emissions figures, which "jumped by the biggest amount on record" to a level higher than the worst-case scenario anticipated by the International Panel on Climate Change (IPCC). That came as no surprise to many scientists, including the MIT program on climate change, which for years has warned that the IPCC predictions are too conservative. Such critics of the IPCC predictions receive virtually no public attention, unlike the fringe of denialists who are supported by the corporate sector, along with huge propaganda campaigns that have driven Americans off the international spectrum in dismissal of the threats. Business support also translates directly to political power. Denialism is part of the catechism that must be intoned by Republican candidates in the farcical election campaign now in progress, and in Congress, they are powerful enough to abort even efforts to inquire into the effects of global warming, let alone do anything serious about it. In brief, American decline can perhaps be stemmed if we abandon hope for decent survival – prospects that are all too real, given the balance of forces in the world. Putting such unpleasant thoughts aside, a close look at American decline shows that China indeed plays a large role, as it has for 60 years. The decline that now elicits such concern is not a recent phenomenon. It traces back to the end of the second world war, when the US had half the world's wealth and incomparable security and global reach. Planners were naturally well aware of the enormous disparity of power, and intended to keep it that way. The basic viewpoint was outlined with admirable frankness in a major state paper of 1948 (PPS 23). The author was one of the architects of the "new world order" of the day, the chair of the State Department policy planning staff, the respected statesman and scholar George Kennan, a moderate dove within the planning spectrum. He observed that the central policy goal was to maintain the "position of disparity" that separated our enormous wealth from the poverty of others. To achieve that goal, he advised, "We should cease to talk about vague and … unreal objectives such as human rights, the raising of the living standards, and democratization," and must "deal in straight power concepts", not "hampered by idealistic slogans" about "altruism and world-benefaction." Kennan was referring specifically to Asia, but the observations generalize, with exceptions, for participants in the US-run global system. It was well understood that the "idealistic slogans" were to be displayed prominently when addressing others, including the intellectual classes, who were expected to promulgate them. In 1949, China declared independence, an event known in Western discourse as "the loss of China" – in the US, with bitter recriminations and conflict over who was responsible for that loss. The terminology is revealing. It is only possible to lose something that one owns. The tacit assumption was that the US owned China, by right, along with most of the rest of the world, much as postwar planners assumed. The "loss of China" was the first major step in "America's decline". It had major policy consequences. One was the immediate decision to support France's effort to reconquer its former colony of Indochina, so that it, too, would not be "lost". Indochina itself was not a major concern, despite claims about its rich resources by President Eisenhower and others. Rather, the concern was the "domino theory", which is often ridiculed when dominoes don't fall, but remains a leading principle of policy because it is quite rational. To adopt Henry Kissinger's version, a region that falls out of control can become a "virus" that will "spread contagion", inducing others to follow the same path. In the case of Vietnam, the concern was that the virus of independent development might infect Indonesia, which really does have rich resources. And that might lead Japan – the "superdomino" as it was called by the prominent Asia historian John Dower – to "accommodate" to an independent Asia as its technological and industrial center in a system that would escape the reach of US power. That would mean, in effect, that the US had lost the Pacific phase of the second world war, fought to prevent Japan's attempt to establish such a new order in Asia. The way to deal with such a problem is clear: destroy the virus and "inoculate" those who might be infected. In the Vietnam case, the rational choice was to destroy any hope of successful independent development and to impose brutal dictatorships in the surrounding regions. Those tasks were successfully carried out – though history has its own cunning, and something similar to what was feared has since been developing in East Asia, much to Washington's dismay. Despite such victories, American decline continued. By 1970, US share of world wealth had dropped to about 25%, roughly where it remains, still colossal but far below the end of the second world war. By then, the industrial world was "tripolar": US-based North America, German-based Europe, and East Asia, already the most dynamic industrial region, at the time Japan-based, but by now including the former Japanese colonies Taiwan and South Korea, and, more recently, China. At about that time, American decline entered a new phase: conscious self-inflicted decline. From the 1970s, there has been a significant change in the US economy, as planners, private and state, shifted it toward financialization and the offshoring of production, driven in part by the declining rate of profit in domestic manufacturing. These decisions initiated a vicious cycle in which wealth became highly concentrated (dramatically so in the top 0.1% of the population), yielding concentration of political power, hence legislation to carry the cycle further: taxation and other fiscal policies, deregulation, changes in the rules of corporate governance allowing huge gains for executives, and so on. Meanwhile, for the majority, real wages largely stagnated, and people were able to get by only by sharply increased workloads (far beyond Europe), unsustainable debt, and repeated bubbles since the Reagan years, creating paper wealth that inevitably disappeared when they burst (and the perpetrators were bailed out by the taxpayer). In parallel, the political system has been increasingly shredded as both parties are driven deeper into corporate pockets with the escalating cost of elections – the Republicans to the level of farce, the Democrats (now largely the former "moderate Republicans") not far behind. A recent study by the Economic Policy Institute, which has been the major source of reputable data on these developments for years, is entitled Failure by Design. The phrase "by design" is accurate. Other choices were certainly possible. And as the study points out, the "failure" is class-based. There is no failure for the designers. Far from it. Rather, the policies are a failure for the large majority, the 99% in the imagery of the Occupy movements – and for the country, which has declined and will continue to do so under these policies. One factor is the offshoring of manufacturing. As the solar panel example mentioned earlier illustrates, manufacturing capacity provides the basis and stimulus for innovation leading to higher stages of sophistication in production, design, and invention. That, too, is being outsourced, not a problem for the "money mandarins" who increasingly design policy, but a serious problem for working people and the middle classes, and a real disaster for the most oppressed, African Americans, who have never escaped the legacy of slavery and its ugly aftermath, and whose meager wealth virtually disappeared after the collapse of the housing bubble in 2008, setting off the most recent financial crisis, the worst so far. • Editor's note: part 2 of Noam Chomsky's discussion of American decline, "The Imperial Way", will be posted at TomDispatch, and here, Wednesday.